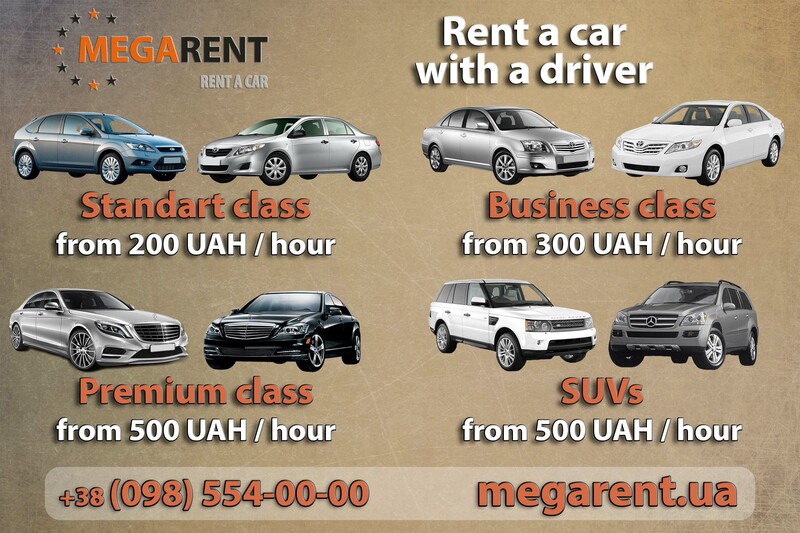 Megarent.ua offers to rent a car with a driver inexpensive. This service now is very popular, it may be necessary for maintenance of business activities, for meeting partners at the airport, business trips, it is most important for foreigners or people who don`t know Kiev very good. Rent a car with a driver in Kiev and Ukraine is more preferable if you intend to rent a car of premium class. In this situation you can forget about managing and driving a car and enjoy the ride with comfort and beautiful views, you are not responsible for the damage of the car if you rent a car with a driver. Also, there is often a need to rent a car with a driver for a wedding or other celebration. Our extensive fleet offers different models of VIP or premium class, SUVs, minivans. With experienced drivers any sightseeing, business trip, as well as corporate travel out of the city will bring only pleasant emotions. Megarent provides rental car with a driver for shooting videos and various commercials. Our staff is ready to answer any questions on the phone numbers listed in contacts.